WILLIAM TECUMSEH SHERMAN. Autograph Letter, to an unnamed general. Annapolis, Maryland, December 8, 1868. 2 pp., quarto. 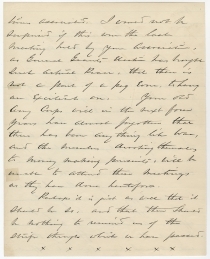 Sherman originally wrote this content as part of a longer letter; he marked this leaf “copy” and ends it with marks that show this section to be complete. 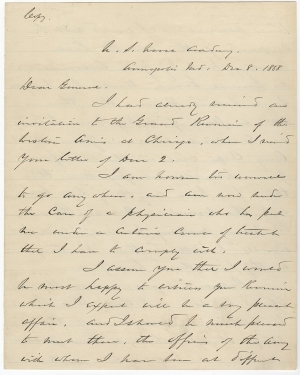 I had already received an invitation to the Grand Review of the Western Armies at Chicago, when I received your letter of Dec 2. I am however too unwell to go any where, and am now under the care of a physician who has put me under a certain course of treatment that I have to comply with. I assure you that I would be most happy to witness your Reunion which I expect will be a very pleasant affair, and I should be much pleased to meet there, the officers of the army with whom I have been at different <2> times associated. I would not be surprised if this were the last meeting held by your Association, as General Grants election has brought such actual Peace, that there is not a part of a peg even, to hang an excitement on. Your old Army Corps will in the next four years have almost forgotten that there has been any thing like war, and the members devoting themselves to money making pursuits, will be unable to attend these meetings as they have done heretofore. Perhaps it is just as well that it should be so, and that there should be nothing to remind us of the strife through which we have passed. The election of 1868, which saw Grant as the Republican candidate, was the first post- Civil War election. 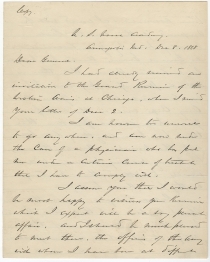 The Republican campaign theme — “Let us have peace”— was taken from Grant’s letter of acceptance. After four years of war, three years of wrangling over Reconstruction, and the impeachment of President Johnson, the nation craved the peace Grant pledged to achieve. Johnson was so unpopular that he failed to secure the Democratic party nomination, which instead nominated Horatio Seymour against the wildly popular (at least in the North and among the Freedmen) hero of Appomattox, Ulysses S. Grant.